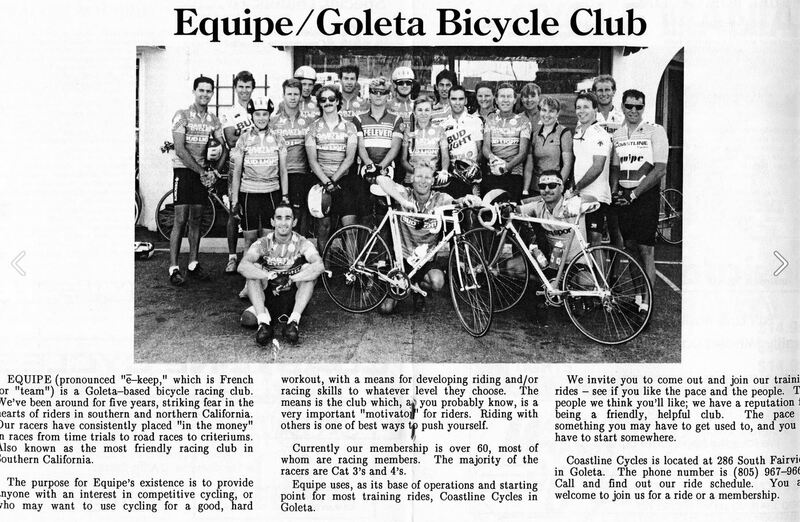 In 1984 Matt Perlee, then manager of Open Air Bicycle in Goleta, and Al Wanta, his chief mechanic, started a bike club and called it Equipe Goleta. The club was dedicated to encouraging cyclists to get into road racing, promoting races in the Santa Barbara area, and motivating riders to keep racing for fun as well as competition. Among the club’s first races was the Mothballs Criterium, an early-February season-opener that is still a fixture on the district racing calendar. Matt soon bought out the store, renaming it Coastline Cycles. Equipe was loosely attached to the shop, but had its own officers and race promoters, including USCF official Richard Hurlbut, brothers Steve and Reed Jolley, and Pete Thomsen. These were good times for road racing in Santa Barbara. The club reached 50 members in the early ’90s. In Santa Barbara, crits were held right on State Street, in the heart of downtown. Visiting stars of that era included the Spago and 7-11 teams, the Russian national team headed by a young Vyacheslav Ekimov, and a junior rider named Bobby Julich. In 1992 the club changed its name to Coastline Racing and moved to a closer association with the shop. A squad of dedicated racers was formed, with Matt as Director. Incentives were introduced to get club members to actually work at races as well as riding in them; and that dedicated squad didn’t just race — they were the club’s officers as well. Two floods in 1995 covered downtown Goleta in mud, and dealt Coastline Cycles a double blow from which it could not recover. Matt sadly closed the shop in the fall of that year. The club survived, though. Members adopted a new name, Echelon Santa Barbara, and elected a new president, Dr. Dave Welton. Change was in the air. Major sponsor Jeff Bermant suggested a Junior racing program, and Olympian Rory O’Reilly was rounded up to coach it. A group of sponsors led by Tom Figge set up a scholarship fund for Juniors. Echelon was awarded IRS tax-exempt status for its qualified programs. The club continued to promote two races each year. Santa Barbara Bikesmiths became sponsoring shop. Women racers got their own training ride and coaching program. Echelon was selected as USCF District club of the year in 1996, and National club of the year in ’98. In 1999, the Echelon board was expanded to 9 members to help spread the increasing administrative load. Dave Welton passed the presidential torch to Bryan Krouse then to James Morgan. The club staged the State Junior Crit Championships, and later in the year our Junior team brought home 6 medals from the Nationals. Dave Lettieri of Fastrack Bicycles joined Steve Daniels Frames and Barry Bash’s Big Gear as local bike-business sponsors. In 2000 the club staged the State Junior Crit again; Aaron Musicant won gold in the 15-16 group. And Echelon rides into the new century with over 100 members, aged 13 to 65, racing in categories from 5 right up to 1 — racing for fun, for health, and for life. Echelon was selected as USCF District club of the year in 1996, and National club of the year in 1998.